Many Java developers find that deploying from an IDE is a more natural fit than deploying from the command-line. In this article, you’ll learn how to deploy to Heroku from two popular Java-based IDEs: Eclipse and IntelliJ IDEA. In both cases, you’ll use the Heroku Maven Plugin to do the heavy lifting. Next, you’ll need to have one one of the IDEs installed. You can download and install Eclipse as describe on the Eclipse download site. For IntelliJ, you can download and install either the free Community edition or begin a free-trial of the Ultimate Edition. Once your IDE is installed, you can use it to open your project. To open your project in IntelliJ IDEA, choose File -> Open and then select the directory location of the Git project you cloned. You can watch a short video demonstration of Eclipse deployment. In the dialog that appears, enter heroku:deploy-war in the “Goals” field, as shown here. 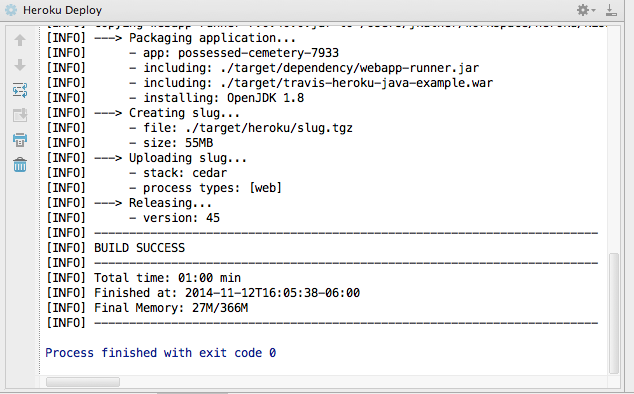 If you were deploying a standalone Java application, you could use the heroku:deploy target to deploy without a WAR file. For more information on deploying standalone apps, see the Heroku Maven Plugin documentation. On some platforms, including Windows, you will also need to set the HEROKU_API_KEY environment variable for the task. Click the “Environment” tab, and select “New…” to create a new variable. Enter “HEROKU_API_KEY” for the name and your API key for the value. You can get your API key by running heroku auth:token at the command-line. Open your application by running $ heroku open -a <app-name> from the command-line, or by browsing to http://<app-name>.herokuapp.com (but replace <app-name with the name of your app). The will create a number of *.launch files in the root of your project. You can click these files in Eclipse to run them. Before opening IntelliJ, ensure that your M2_HOME environment variable is set to the location of your Maven installation. If you would prefer not to set this variable, then you may need to configure the path to your Maven installation under Preferences -> Maven within IntelliJ. 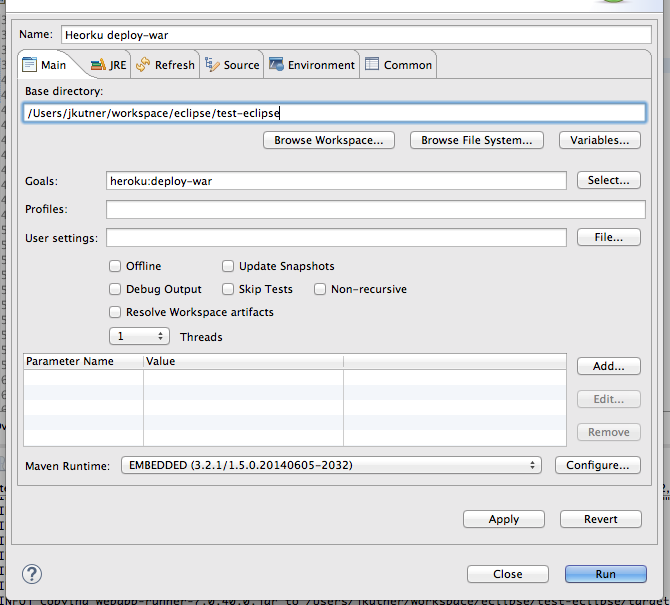 To deploy, select Run -> Edit Configurations from the IntelliJ IDEA menu. 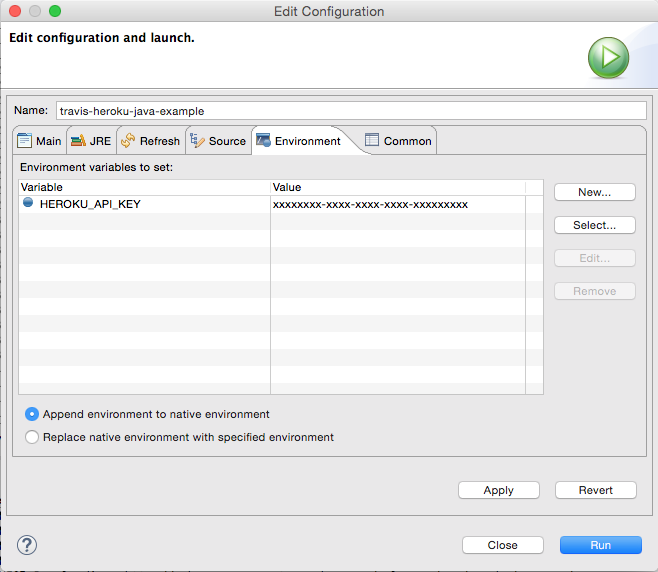 Then select the + button to create a new Maven configuration. 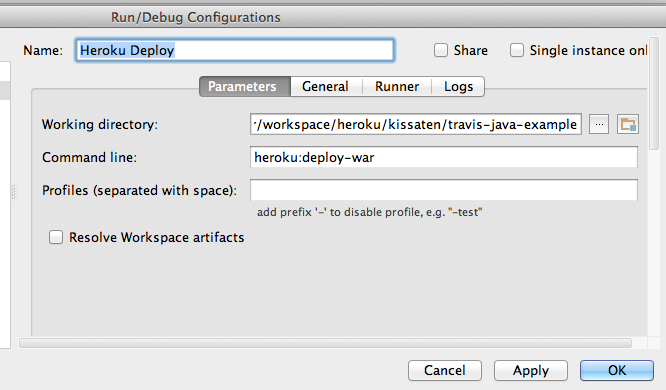 Then name the configuration “Heroku Deploy”, and enter heroku:deploy-war in the “Command Line” field as shown here. Click “OK”. Now a “Heroku Deploy” task will be shown in the Run Configurations toolbar. Press the green arrow button next to it. Open your application by running $ heroku open -a <app-name> from the command-line, or by browsing to http://<app-name>.herokuapp.com (replace <app-name with the name of your app). Your app name will be something other than “gentle-shore-6874”. Then check that the value in your HEROKU_API_KEY is correct. For more information on using Maven with Eclipse, see the Eclipse documentation. 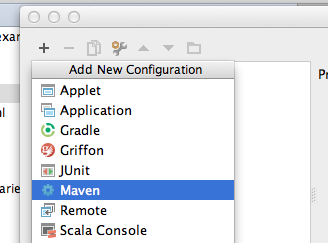 For more information on using Maven with IntelliJ IDEA, see the IntelliJ documentation. 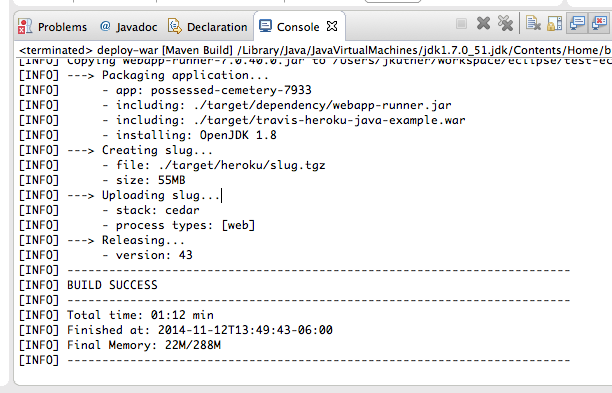 For more information on the Heroku Maven plugin, see the DevCenter article Deploying Java Applications with the Heroku Maven Plugin.